My Tehran for Sale is a relatively unique film in several respects. First of all it is listed as an Australian-Iranian co-production. Second, it presents a fascinating and closeup view of the vibrant, clandestine (though precarious) underground cultural scene in Tehran. Written and directed by Granaz Moussavi, the film takes a look at the struggles of young people to find outlets in Iran for their creative expression. Ms. Moussavi was already an established poet when she migrated with her family to Adelaide, Australia, in 1997 at the age of 23. There she took up film studies at Flinders University, and My Tehran for Sale was her debut feature. The film was shot secretively over a two-month period without government approval; and then an electronic copy of the footage was smuggled out of the country and finally edited into the finished film in Adelaide. Under such circumstances, there was probably limited opportunity to film everything that had been planned and no possibilities of reshooting and filling in. These circumstances probably led to some of the artistic choices made concerning the sequencing of the events filmed. I should first remark with respect to the key cultural themes of this movie that in the West, we are all used to the normative differences between public space and private space. What is permissible behaviour and dress inside closed living quarters may be less acceptable outside on the street, i.e. the public space. In Iran this distinction is particularly severe. As is well known, the Iranian public space is tightly restricted, particularly in connection with what women can wear and do. Yet as Hooman Majd has observed about Iran, behind closed doors, in private dwellings, people have a lot of leeway to do what they want . Inside, women dress up, wear stylish clothes, and look every bit as glamorous (if not more so) as attractive Western women. But in My Tehran for Sale, we see another, intermediate space, that people are trying to form that is situated between the public space and the closed, personal private space. This is the hazy middle layer or space, facilitated by social networking, where people get together at clandestinely advertised gatherings or rave parties that is just below the radar of the “moral police”. It is this thrilling, underground, semi-public space that is the backdrop for My Tehran for Sale. 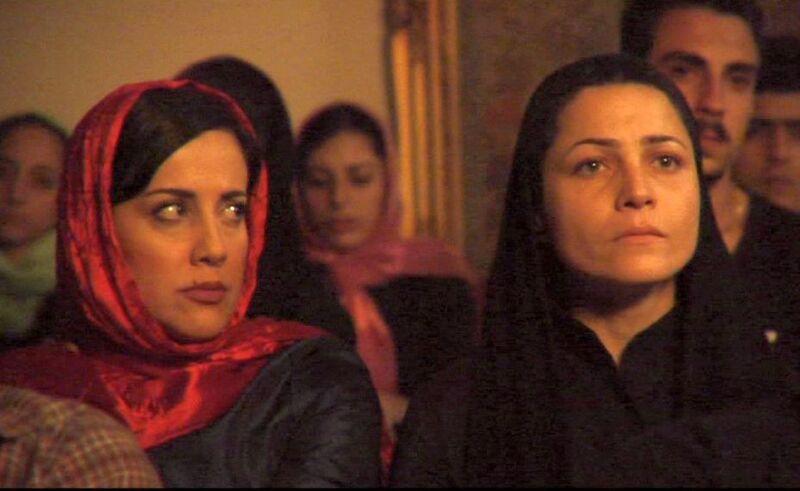 The story concerns a young woman, Marzieh (Marzieh Vafamehr), who is an actress in an underground mime theater group. The group is highly skilled, but they are never allowed to perform in public, although they are hoping to stage a performance soon. Through the connections of her vivacious friend, Sadaf (Asha Mehrabi), who happens to be a professional psychologist, Marzieh meets a young man, Saman (Amir Chegini), who had emigrated to Australia a decade or so earlier but who has recently returned to Iran to try and make some money. The focus of the story is mainly about Marzieh and Saman, but it is told (i.e. the syuzhet) in a highly fragmented and nonlinear fashion. I will first give a basic outline of the fabula (the linear story that we construct in our heads as we watch), and then go back to this rather problematic syuzhet. Early on Marzieh and Saman become a couple, and Saman moves into Marzieh’s apartment. He promises to sponsor her Australian visa application so that they can live together in freedom in Australia (and presumably get married). They go to underground parties, where Saman is delighted to have the opportunity to smoke spot. From one-sided conversations they each have with their mothers, it is clear that their conservative families don’t trust them and regard them as hooligans. The film then wanders back and forth between (a) Marzieh’s activities with her girlfriends and her acting group (which is mostly composed of men) and (b) her activities together with Saman and her attempts to secure an Australian visa. The latter activities involve some bureaucratic procedures and also require some extensive and expensive medical tests. But when the visa-required medical tests report that Marzieh is HIV+, her relationship with Saman is ruined, and he walks out on her. Marzieh still wants to go to Australia, but now there is no way she can get her visa approved. So she decides to arrange with human traffickers to smuggle her into Australia as an asylum seeker. The payment to the traffickers is huge, so she has to sell off everything she owns, hence the title of the film. We learn indirectly that she does make the trip, but she is arrested by the Australian authorities and is held in a detention camp for illegal immigrants. After two years in detention, Marzieh’s asylum petition is rejected by the Australian immigration authorities as having no “value”. They only offer a free trip back to her country of origin (where I presume medication for her health condition is unlikely to be available). At the end of the film, we see shots of Marzieh walking alone on the Tehran streets at night, so I presume this is where we leave her – a sensitive and creatively intelligent woman who has been abandoned by her society. This basic story information is what one can piece together from what is presented on screen, but the temporal sequencing is completely jumbled. Throughout the film the viewer sees decontextualized elements (from an interview in the Australian detention camp and sequences when Marzieh is being transported inside a truck to escape across the Iranian border) that only begin to make sense after the viewer has reassembled elements of this jigsaw puzzle. This gives the film an impressionistic feel, as though one were examining shards of broken glass and were required to try to piece together these fragments into something coherent. As I mentioned, the difficult filming circumstances may led to narrative gaps that Moussavi tried to bridge by assembling the pieces in this fashion. Unfortunately, this approach doesn’t really work, and all one has is a lot of broken pieces. The cinematography also has mixed results. Some of it, particularly the interiors, is very well done with numerous atmospheric and evocative compositions. But there are a number of very shaky hand-held camera shots that detract from the viewing experience. Despite these serious shortcomings, there are several interesting aspects of My Tehran for Sale that deserve praise. The acting performance of Marzieh Vafamehr as “Marzieh” is very good. Even though the sincerity of her amorous feelings for Saman is unconvincing, the overall feelings that she conveys and her demeanor mark the film with her personal signature. In particular her stoic and persistent pursuit of artistic self-expression in the face of so many social roadblocks is downright heroic. 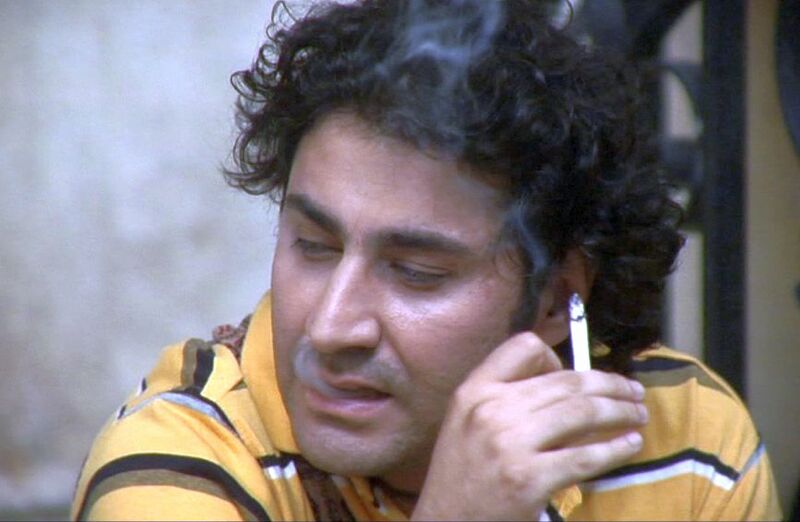 The performance of Amir Chegini as “Saman” also deserves mention. He embodies here a certain self-indulgent Iranian male type almost to perfection, and his portrayal is crucial to setting the difficult social milieu in which Marzieh has to operate. The presentation of the underground Iranian cultural scene is fascinating, as well. This includes poetry and music from Mohsen Namjoo, Babak Mirzakhani, and Haale Gafori. This subculture has previously been the subject of work from Iranian filmmaker Bahman Ghobadi, and it is my understanding that he provided some assistance for this film, too . 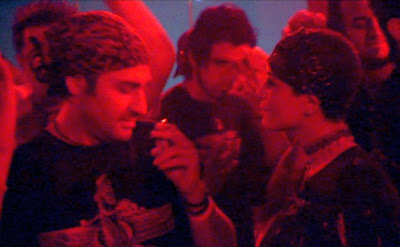 At the beginning of My Tehran for Sale, we see Marzieh and Saman dancing together at an illegal underground rave that is being held at a farm. It is a crowded, chaotic scene with rousing music and plenty of mixed-couple socializing, which is suddenly interrupted by a raid from Basiji “morality police”. Marzieh and Saman escape arrest, but the others, including Marzieh’s friend Sadaf, are rounded up and arrested. Sadaf is then reported to have been subjected to 35 lashes in accordance with Iran’s Islamic Penal Code . So it was disturbingly ironic, but perhaps not surprising, that when bootlegged copies of My Tehran for Sale found their way into the hands of Iran’s morality police, this same kind of uncivilized treatment of women was repeated in real life – the film’s star, Marzieh Vafamehr, was arrested and sentenced to one year in prison and 90 lashes . After various international protests were waged, an appeals court later reduced her sentence, and Ms. Vafamehr was released in 2011 after five months of confinement. In the face of this kind of social climate, I can only stand in awe of the moral and artistic courage of people like Granaz Moussavi and Marzieh Vafamehr who are using their fundamental rights of self-expression to try and make this a more empathic and inclusively supportive world. Majd, Hooman, The Ayatollah Begs to Differ: The Paradox of Modern Iran (2009), Anchor. Nafus, Chale, “My Tehran for Sale” (2013), Austin Film Society, http://www.austinfilm.org/page.aspx?pid=1716. “Iran: Flogging - Lashing” (2011? ), Violence is Not Our Culture, http://www.violenceisnotourculture.org/content/iran-flogging-lashing. “Iran: Film Actress Sentenced to 90 Lashes" (2011), Violence is Not Our Culture, http://www.violenceisnotourculture.org/content/iran-film-actress-sentenced-90-lashes.